Using the carefree innocence of childhood to illuminate the struggles of a low-income family, Sean Baker's The Florida Project presents an emotional mixture of playful joy and all-too sobering desperation. Fueled by a delicately stylized blend of realism and little hints of fantasy, the movie creates a potently emotional and affecting depiction of growing up against a backdrop of poverty. And beyond the film itself, the disc features a very nice A/V presentation and an insightful collection of supplements. Recommended. When viewed through the eyes of a child, even the most mundane or challenging circumstances can seem magical. Where an adult might only see a rundown motel on the side of a long stretch of highway, a youthful gaze might instead see a playground full of possibilities. And it's through this curious and innocent perspective that director Sean Baker allows us to see the world of The Florida Project, placing a deeply human and faintly whimsical spotlight on the everyday joys and painful hardships of a demographic far too often ignored. Unable to afford an apartment, six-year-old Moonee (Brooklyn Prince) and her single-mother Haley (Bria Vinaite) live in a cheap motel dubbed the Magic Castle near Walt Disney World. As the summer unfolds, Moonee spends her days playing with her friends and getting into mischief. All the while, the motel's stern yet loving manager, Bobby (Willem Dafoe), begrudgingly puts up with the kids' troublesome antics. But as Haley continues to struggle to get by, the realities of living week to week begin to take their toll on the family. For much of the film, Baker simply focuses on Moonee's various escapades with her friends, weaving a loose narrative as the kids get into (mostly) harmless and often humorous trouble exploring the motel and nearby shops. Throughout it all, the director creates a delicately stylized aesthetic, blending fly-on-the-wall naturalism with hints of more impressionistic flourishes. Gliding handheld shots follow the roaming children while wide panning images create a great sense of space, helping to elevate the Magic Castle and its colorful pastel walls beyond the setting's otherwise depressing reality. A shot of all the motel lights suddenly flickering on at dusk and another scene featuring a rainbow beaming above after a rainstorm both prove to be particularly affecting, revealing little sparks of aching beauty hidden among the ordinary. And though all these episodic pieces initially feel a bit random, the script's once disparate and unruly plotting slowly starts to coalesce into something surprisingly concrete as the runtime reaches its climax. Subplots involving Haley and Bobby come to a head, forcing earlier playful elements of the film to transition into devastatingly harsh developments that paint an all-too-real portrait of heartbreaking desperation, poor decision making, and societal neglect -- all without becoming overbearing or casting judgment on the film's flawed protagonists. Instead, the movie's characterizations feel unapologetically raw. To this end, Haley and Moonie don't always come across as particularly likeable. In fact, the kid can be downright bratty and crass at times, and her mom is often alarmingly irresponsible and belligerent. But beneath this occasionally questionable behavior lies a deep bond and loving connection, all impressively conveyed with a startling sense of authenticity through first-time actresses Brooklyn Prince and Bria Vinaite (who was actually discovered by the director on Instagram). Likewise, the great Willem Dafoe complements the ensemble of newcomers with a powerfully understated, Oscar-nominated performance as the kindhearted Bobby. Together, the cast and filmmakers end up crafting an empathetic yet refreshingly unsanitized depiction of life in poverty. It's rare for characters like Haley and Moonie to be the subject of a film. They're marginalized and imperfect, and not in a typical Hollywood or even "Indie" way. They're fun, infuriating, heartbreaking, and uncomfortable to watch all at once. Focused on a social class that some would rather look away from or dismiss rather than confront and try to relate to, The Florida Project uses the perspective of childhood to weave a powerfully humanistic tale -- one where the escapist power of fantasy is both joyous and devastatingly bittersweet. 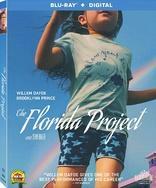 Lionsgate presents The Florida Project on a BD-50 Blu-ray disc housed in a keepcase with cardboard slipcover. Instructions for an UltraViolet Digital Copy are included inside. After some skippable trailers, the disc transitions to a standard menu. The packaging indicates that the release is region A coded. The movie is provided with a 1080p/AVC MPEG-4 transfer in the 2.40:1 aspect ratio. Nicely detailed and delicately stylized, this is a surprisingly impressive image. Shot primarily on film (with digital cameras used for night scenes and the finale sequence), the source carries a consistent look with a light, natural layer of grain visible in most shots. A few negligible specks pop up here and there but the image is thankfully free of any pesky digital artifacts. Clarity is sharp with a nice sense of depth and texture throughout the film's locations, bringing a level of dimension and vibrancy to what could have otherwise comes across as just a dull motel setting. On that note, colors are rich, allowing the purple walls of the Magic Castle, lush greens of the Florida grass, and various bold primaries splashed across the Disney area gifts shops to pop from the screen. Whites are bright as well along with deep and consistent blacks, resulting in a great sense of contrast, especially during a nighttime scene set against colorful fireworks and another memorable shot that sees all of the motel lights suddenly flicker on after the sun sets. Despite the film's very modest budget, The Florida Project hits Blu-ray with an artistically and technically impressive transfer, finding hints of beauty and whimsy amid a seemingly drab and otherwise depressing environment. The film is presented with an English DTS-HD MA 5.1 track, along with optional English SDH and Spanish subtitles. Though limited in scope, the sound design does a solid job of bringing the motel setting to life. Dialogue is full-bodied and clean throughout with no balance issues or other technical quirks. The soundstage features an appropriate sense of Florida ambiance, layering birds and crickets into the background of the track. Passing cars traveling down the highway and frequent helicopters in the sky also bring another level of atmosphere to the motel setting. With that said, the mix is fairly front-loaded and notable LFE is (understandably) rare. Still, the surrounds are used well for specific effects, like music being played over the speakers in a store or falling rain during a storm. Likewise, a fireworks show perks things up nicely and the score used during the movie's climax features strong range and separation, purposefully juxtaposing against the film's otherwise delicate style. A bit more texture and surround use here and there could have helped to create a more immersive experience, but as it stands, the track suits the material well. Under the Rainbow: Making The Florida Project (HD, 22 min) – This is a very worthwhile behind-the-scenes look at the movie's production, with fly-on-the-wall peeks at the location scouting, rehearsals, and day-to-day shooting. Refreshingly candid, the featurette reveals a few moments of frustration for the director (pesky background noise during a scene) along with some interesting details regarding a pretty major mid-production script rewrite. Bloopers and Outtakes (HD, 3 min) – Here we get a short reel of flubbed takes from the shoot, mostly focused on the adorable child actors acting like adorable child actors. Cast and Crew Interviews (HD, 50 min) – Viewable separately or together, this a collection of seven interviews with the cast & crew, including Sean Baker, Willem Dafoe, Brooklynn Prince, Valeria Cotto, Bria Vinaite, Mela Murder, and Chris Bergoch. The participants discuss the movie's origins, what it was like working together, and their general thoughts on the film and characters. Sean Baker's The Florida Project presents an affecting portrait of poverty as seen through the whimsical and innocent eyes of childhood. The Blu-ray features an impressive video transfer and a very solid audio mix. Likewise, the included featurette and interviews are well worth a look. This isn't always an easy film to watch, but the experience is sure to leave a lingering impression. Recommended.